Welcome to our Elfeves store, we are a specialty retailers for men's neckwear. We have been designing, producing, and retailing men's ties online. The Elfeves collection of pre-tied Vivid print bow ties is very popular to wear with tuxedos and is great for weddings, proms, schools, choirs, sports teams and individuals looking for a quality bow tie at a great price. 1)This makes it an updated traditional bow - it is slightly slimmed down and modern size - definitely not your Grandfather's fluffy bow tie. 2)The bow on the tie is pre-tied, which means you don't have to learn to knot a bow tie and the bow is attached to an adjustable band which clips around your neck. This is a completely different mechanism than an old school clip-on or clip on style bow tie, which can easily fall off or become crooked. 3)The material on the tie is a satin poly, with just the right amount of sheen, so that it's not too shiny nor is it flat. Brightly solid colored bow ties are typically not suited for traditional formal dress codes. Nevertheless, they are very popular for certain functions such as outfitting the wedding party with matching colored neckwear to the wedding theme color, for school proms and dances, as well as for kids. 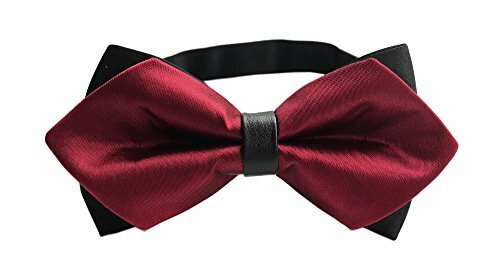 Material 100% care-free microfiber , Skinny pre-tied solid color patterned Bow tie 11.5CM * 5.5CM, Weight 30-50 g. Suitable for women or men or big boy. Classic design for casual, formal, graduation, celebration, weddings, party or business wear. A must-have for any gentleman's wardrobe is a burgundy tie. This deep and rich tone is endlessly versatile in style and events. Dress this handcrafted bowtie up or down without having to second guess anything, as you can't go wrong with a piece like this. The difficultly achieved dimple impressions are already present, as this is a pre-tied design, giving you true style at minimal effort. We love to see this piece paired along with a gray sportscoat in wool and a crisp white button up underneath. Go the extra mile by adding an extra pocket square with a subtle pattern.